The Seahawks drew 12 penalties in their 22-16 win over Arizona Thursday and are on pace to break the NFL’s single-season record. On third and six from the Seattle 46, rookie CB Shaquill Griffin was flagged for pass interference, giving the Cardinals a first down. Three plays later, on third and eight, CB Justin Coleman drew a ticky-tack,hands-to-the-face-penalty, giving the Cardinals another first down. Then, on first and 10 from the Seattle 33, DT Sheldon Richardson was called for roughing ‘ Stanton, helping set up a 14-yard TD pass to TE Jermaine Gresham, tying the score 7-7. With four fouls, the defense all but gifted Arizona the touchdown. The Seahawks went on to win 22-16 despite losing All-Pro CB Richard Sherman to a season-ending Achilles rupture (see Thiel: Seahawks get a win, but lose Sherman) and despite a continuation of rules-breaking that threatens to be historic. It’s all about the penalties. The Seahawks drew 13 flags (12 accepted) for 108 yards. In addition to the four that abetted Arizona’s first touchdown, there were two false starts (Germain Ifedi, Matt Tobin), offensive holding (Terence Garvin, Oday Aboushi, Ethan Pocic)), clipping (Luke Willson), defensive pass interference (Jeremy Lane) and defensive offsides (Bennett). A week ago, in a never-should-have-happened loss to the Washington Redskins at CenturyLink Field, Seattle incurred a season-high 16 penalties (one shy of the club record against Green Bay in 1984) for 138 yards. Two weeks before that, against the New York Giants, the Seahawks were docked 15 times for 110 yards. The Seahawks have been penalized 94 times for 780 yards. Excluding Russell Wilson’s 290, and Seattle has more penalty yards than rushing yards, 616. The Seahawks have 21 more penalties that the second-most penalized team, the New York Jets. Another thing about Seattle’s 94 penalties: Since the NFL and American Football League merged in 1970, only the 1993 and 2016 Raiders had as many as 94 in the first nine games of a season. 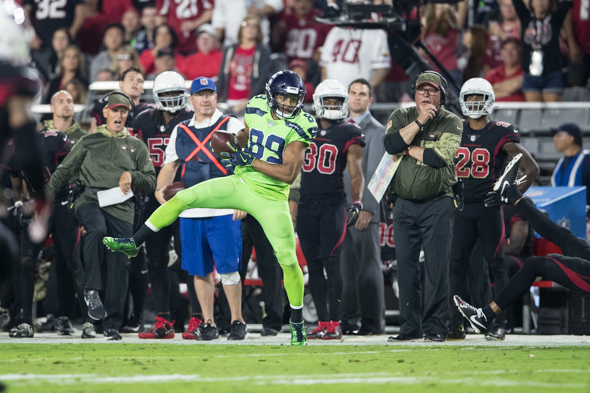 No Seattle team had more than 83 in the first nine games (83 in both 1984 and 2011). The franchise record for most penalties in a season is 138 in 2011. At their current rate of 10.44 per game, the 2017 Seahawks would wind up with 167. That would also break the NFL’s single-season record, 163 by Oakland in 2011. During Pete Carroll’s eight years as head coach, the Seahawks have led the NFL in penalties twice, in 2013 and 2014, both Super Bowl years. They have been in the top 10 in penalties five other times, all but one of those playoff years. The Seahawks have always been able to overcome penalties. Somehow, this year seems different. The Hawks are usually among league leaders for penalties on the defensive side due to their aggressive approach but on the offensive side it can’t be surprising when the O-Line is constantly retooled, many timesvwith low drafted or undrafted rookies or even well traveled journeymen. Tom Cable can’t make an omelette with only one and a half eggs. The last time the club sent any offensive linemen to the Pro Bowl was Max Unger in 2013 and the last one named All-Pro was Walter Jones in 2008. It’s important to let the current group grow together if they’re going to become a cohesive unit. True. Turnover is poison in the O-line, and that’s part of the proneness to pens. Duane Brown is good, but if you believe he has assimilated easily, then you believe that training camp and exhibition season are worthless. After the loss to Washington, there was much talk by Pete Carroll about the excessive penalties. One would have thought that this would have sunk into the heads of the offenders that you listed, Steve. In Thursday’s game the number of penalty yards was reduced by a paltry 22%. Will the Hawks ever learn to be more disciplined? Among the pens, the ones most likely the result of inexperience are offensive holds among linemen. That figures to get better, and it starts with Ifedi. Particularly when the majority of those holds are the result of “good” blocks that turn into holds when Russell scrambles.